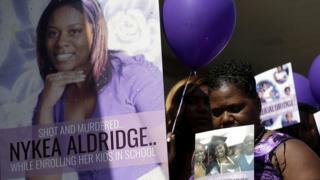 Chicago has experienced one of its deadliest August months in 20 years, with 11 people murdered last weekend, including Nykea Aldridge, cousin of NBA star Dwyane Wade. While two men have been arrested in connection with her murder, many of Chicago's killings go unsolved. The city has been beset by high numbers of shootings and homicides by gun violence, over many years. Here is a look into what the numbers say about Chicago's violence. While Chicago is on track to see as many as 600 murders this year, it does not have the highest murder rate per capita in the US. But shootings have often been concentrated in gang-heavy neighbourhoods, making the risk of being caught in the crossfire a very real one for people who live there. A large majority of homicides in Chicago are from gunfire, and occur within a half-mile of the victim's home, according to data collected by local online news source DNAInfo.